Several governors were sent home after the August 8 general election because of poor performance and the public has declared this will be the trend. Those who retained their seats have tightened their belts, saying time and again that they will not tolerate corruption and laziness as residents must get the best services. Of the 47 county chiefs, five have caught the people’s eyes but only time and their performance will tell what the 2022 general election will mean for them. Mutua started delivering on his pledges in the run up to the election in which he garnered 249,603 votes. Last week, he launched the first real time road construction project by applying bitumen and tarmac on a one kilometer stretch in a record 10 minutes instead of the average one hour. Posting the news on his Facebook account, Mutua said the new 20-kilometer Kivandini to Masinga Town road showed his approach to serving his people for another five years. “Using the Super Maendeleo Chap Chap Philosophy, we are applying a tarmac seal at a record 100 metres in one minute; one kilometer in 10 minutes! The Governor is credited with the establishment of Machakos People’s Park and the Machakos stadium where Kenya won the Cecafa title. He also installed CCTV cameras across the county and bought patrol vehicles to curb crimes, and dug 205 boreholes and 166 dams. Mutua wants to succeed Uhuru Kenyatta as president in 2022. Considered to have engaged in one of the most fiery re-election campaign, Wa Iria is one of the two governors who managed to retain their seat in the Mt Kenya region. The Governor won by a big margin based on his track record, mostly the economic empowerment of residents though projects locals described as “touching lives’. Key among them is the installation of 35 milk coolers in all the wards to increase production. The programme that will be rolled out in all market and trading centres, will make trade in milk more profitable – thecurrent market price is Sh35 per liter. While launching the project, Wa Iria said the milk will be branded as a product of the county to give farmers ownership. “A contract agreement with Brookside of 80,000 kgs per day will continue. The plant will process the surplus milk which will be sold under the brand name ‘Murang’a Fresh’,” he said. The Governor is also credited with a street lighting programme to turn Murang’a town a 24-hour economy. He also launched the ‘youth one cow’ project for members of dairy cooperated associated with Murang’a County Creameries get a cow on credit terms. Many in the county have enrolled. Early in the year, the Murang’a boss launched a programme to provide free milk once a week to more than 300,000 pupils, to improve their health and enhance dairy farming. The Governor is yet to publicly declare his 2022 ambitions but sources say he wants to be the next Mt Kenya kingpin. 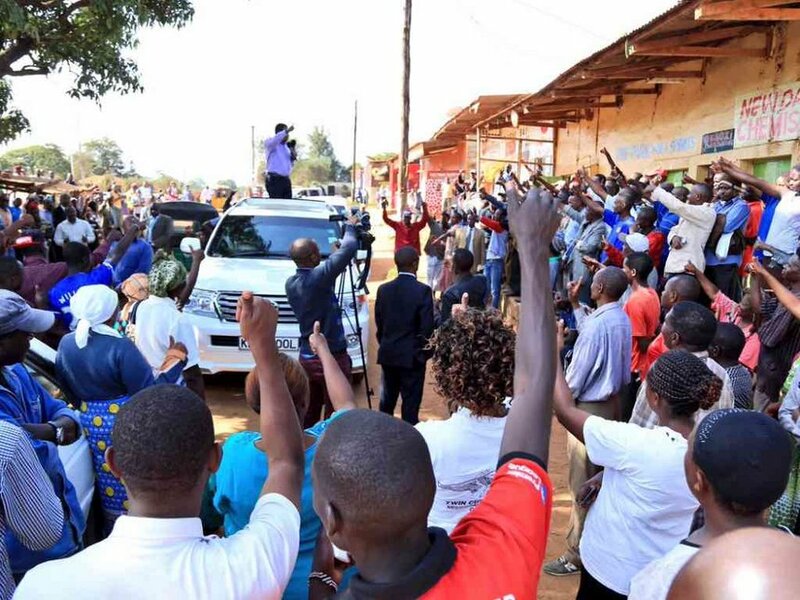 “During President Uhuru’s re-election campaign, the Governor ran campaigns with leaders in Muranga, Kirinyaga, Nyeri and even Nyandarua. At some point, he went to campign for the President in Mombasa. Given his assumed close links with Deputy President William Ruto, Wa Iria is making plans for the king maker position,” said a former adviser who did not want to be named. One of the most vocal governors who openly criticises President Uhuru Kenyatta, Joho successfully defend his seat in August and has already declared interest in the presidency come 2022. He and Kilifi chief Amason Kingi also want the Coast to secede so their people are no longer marginalised. Joho has been very critical of the Jubilee government and has been at loggerheads with Uhuru and Ruto over projects in the Coast. The ODM deputy party leader, who is considered the Coast region kingpin said said their differences were never personal but for answers on critical matters. A year ago, the Governor kicked off a Sh 200 billion housing development plan in the city and pushed on with it despite opposition from various leaders in the region. He has invested in infrastructure development and has taken up projects such as cabro paving and construction of classrooms and office blocks in schools. After his re-election, Joho created a Vision 2035 portfolio, which will be manned by Deputy Governor William Kingi, to accelerate development in the coastal town. The economic hub of the country, Nairobi, is the only of five counties where a new Governor was elected. Sonko is planning many grand changes, including literally cleaning the city and streamlining the transport sector. The former Senator, who defeated Evans Kidero in the vote, has embarked on these projects but the journey has proven tough. After clinching the seat, Sonko said small-scale businesses managed by youth and women will soon start bagging one in every three tenders awarded by Nairobi. Women and youth will receive requisite training in entrepreneurship to survive in the competitive business environment. To address the garbage problem, Sonko’s government is going to invest in a recycling plant at the Dandora dumpsite. “Once complete, the recycling plant shall address the garbage dumping challenge we are currently facing in Nairobi,” he said. The Jubilee Party Governor also pledged 30 per cent of the county budget for development projects. Sonko also said he will amend “archaic” bylaws not conducive to business and plans to cap the wage bill at 30 per cent. The former Senator is said to have secured the ticket because of videos and audios of “embarrassing activities” involving key people around the President. He is yet to make any announcement on his future but is considered a favourite in political shaping and a politician who knows how to survive. Under the leadership of Council of Governors chairperson Josphat Nanok, Turkana residents are expecting major transformation and proceeds from substantial oil deposits. The black gold is expected to largely benefit locals according to proposals in the Petroleum (Exploration, Development and Production) Bill, which went through after its first reading in the National Assembly. MPs from the the second largest county by size will be required to approve contracts between the national government and oil companies. Under Nanok, residents have started enjoying the benefits of devolution. These include Napuu I Drip Irrigation Scheme for supply of food under the Integrated Development Plan (CIDP) for the years 2013-2017. The scheme aids water harvesting from underground aquifers and solar power for drip irrigation. The 65-acre piece of land has been turned into a reliable source of food for more than 150 families. In terms of peace and unity, the county holds the Turkana Cultural festival annually to bring all the sub-tribes together. Nanok has also partnered with the the national government to build Kitale/Lodwar/Lokichoggio road.